The VW Type 128 and 166 Schwimmwagen (literally Swimming Car) were amphibious four-wheel drive off-roaders, used extensively by German ground forces during the Second World War. The Type 166 is the most numerous mass-produced amphibious car in history. Volkswagen Schwimmwagens used the engine and mechanicals of the VW Type 86 four-wheel drive prototype of the Kübelwagen and the Type 87 four-wheel drive 'Kübel/Beetle' Command Car, which in turn were based on the platform of the civilian Volkswagen Beetle. Erwin Komenda, Ferdinand Porsche's first car body designer, was forced to develop an all-new unitized bodytub structure since the flat floorpan chassis of the existing VW vehicles was unsuited to smooth movement through water. Komenda patented his ideas for the swimming car at the German Patent office. The earliest Type 128 prototype was based on the full-length Kübelwagen chassis with a 240 cm (7.9 ft) wheelbase. Pre-production units of the 128, fitted with custom welded bodytubs, demonstrated that this construction was too weak for tough off-roading, had insufficient torsional rigidity, and easily suffered hull-ruptures at the front cross-member, as well as in the wheel-wells. This was unacceptable for an amphibious vehicle. The large-scale production models (Type 166) were therefore made smaller, and had a wheel-base of only 200 cm (6.6 ft). VW Schwimmwagens were produced by the Volkswagen factory at Fallersleben / Wolfsburg and Porsche's facilities in Stuttgart; with the bodies (or rather hulls) produced by Ambi Budd in Berlin. 15,584 Type 166 Schwimmwagen cars were produced from 1941 through 1944; 14,276 at Fallersleben and 1,308 by Porsche. Given these numbers, the VW 166 is the most mass-produced amphibious car in history. Only 189  are known by the Schwimmwagen Registry to remain today, and only 13 have survived without restoration work. 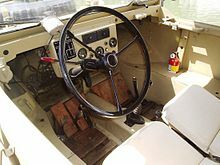 All Schwimmwagen were four wheel drive only on first gear (and reverse gears with some models) and had ZF self-locking differentials on the front and rear axles. Just like the Kübelwagen, the Schwimmwagen had portal gear rear hubs that gave better ground clearance, while at the same time reducing drive-line torque stresses with their gear reduction at the wheels. The Schwimmwagen could go up to 50 miles per hour(80 km/h) on land. When crossing water a screw propeller could be lowered down from the rear deck engine cover. When in place a simple coupling provided drive straight from an extension of the engine's crankshaft. This meant that screw propulsion always drove forward. The Schwimmwagen could go up to 6 miles per hour (9kph) in the water. 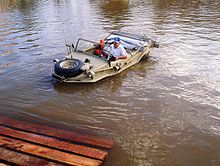 For reversing in the water there was the choice of using the standard equipment paddle or running the land drive in reverse, allowing the wheel-rotation to slowly take the vehicle back. The front wheels doubled up as rudders, so steering was done with the steering wheel both on land and on water. ^ Baxter, Ian (2014). Waffen-SS on the Eastern Front 1941-1945: Rare Photographs from Wartime Archives. Pen and Sword. p. 99. ISBN 9781781591864. ^ Lemmens, Bart. "VW-Schwimmwagen type 166 - The VW-Schwimmwagen Registry". Vw166.com. Archived from the original on 2009-05-15. Retrieved 2009-07-25. Wikimedia Commons has media related to Volkswagen Schwimmwagen. This page was last edited on 7 March 2019, at 17:39 (UTC).